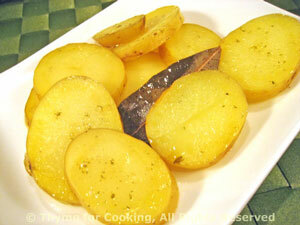 Potatoes Braised in Olive Oil, Bay Leaves, Thyme for Cooking easy potato sides. This is a simple dish of potatoes and bay leaves, braised in olive oil. They can be done in a skillet or a covered dish in the oven. Slice the potatoes about 1/4" (.5cm) thick. Put the oil in a baking dish large enough to hold the potatoes in one or two layers, but not tightly packed. Add the potatoes and turn to coat thoroughly. Tuck the bay leaves in amongst the potatoes, cover and bake for 35 minutes, 400F (200C). Remove from oil, discard bay leaves and serve.